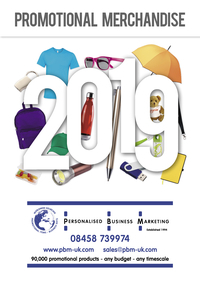 PBM has been supplying one of the greatest ranges of promotional products in the UK since 1994, and today we can brand over 90,000 products with your company logo or information with whatever budget and timescale you desire. Our website contains our best-selling products across the vast range of branded merchandise we can provide, but showing all of the thousands of products we can supply on the website or in our catalogue would be impossible. So if you cannot find exactly what you are searching for, feel free to ask us as chances are, we supply it. Wondering if you are making the best decisions about your promotional merchandise? Worried that you might be missing something? At PBM our friendly and experienced team will make sure you that you have enough information to make the right decisions. Thus you can accomplish your company's commercial goals and get more out of your advertising budget. We have a team of friendly account managers who can advise on any events or campaigns your company has coming up, including bespoke ideas lists. Best of all, it only takes one phone call or e-mail to reach them. Naturally, you will want to know that your product will actually look the way you want it to. Here at PBM we always e-mail you with a digital proof for your approval before production. We can also provide samples of our products within 2 to 3 working days of your request. If required, we can tailor your ordered products with bespoke printed packaging such as boxes and bags. We will track the progress of your order until the goods have been delivered and we have confirmation that you are satisfied with both the products and the service. PBM provides the fastest, easiest, most reliable and least expensive way of purchasing promotional merchandise.